Update: We've given our Philips Hue smart light bulb deals guide a revise for Cyber Monday 2017, and there are many ways to save on these smart bulbs. If 2018 is going to be the year of the smart home for you, you're going to need a few smart bulbs to get the party started. To that end, there's no better purveyor of smart lights than the folks at Philips Hue. Not only do the same people who make your electric toothbrush make smart bulbs but, honestly, they're pretty much leading the pack when it comes to the technology. And sure, while there are cheaper alternatives out there (cough, Sengled) Philips' catalog of smart lighting products is far and away better than nearly anything else on the market right now. Let's be honest, though, you probably knew all that. You're a bright bulb yourself! No, what you're here for are the deals - well don't worry, there are plenty of those floating around these parts. It is Cyber Monday after all. 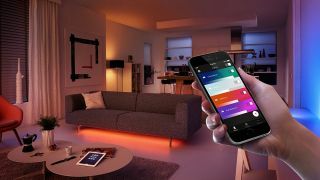 Without further ado, these are the best deals we've found on the web for Philips Hue starter kits, Hue bulbs, lightstrips and Hue Go lights. Sure you could build you Philips Hue collection piece-by-painstakingly-expensive-piece or, you could save yourself all the hassle and just pick up one of these excellent starter kits. Inside you'll find three Richer Color bulbs and a Philips Hue Bridge (basically a must-own device that communicates with the bulbs). While three bulbs won't be enough to maintain the party, it's certainly more than enough to get the party started. If fancy colors aren't really your thing, that's OK. Philips makes a flavor of Hue just for you - it's called White. You may have seen it on a lightbulb before. In all seriousness, though, the Philips Hue White Starter Kit is brilliant at the basics: it can add light to any room in your home and be controlled either via an app on your phone or via voice commands to your Amazon Echo or Google Home. It's simple. It's effective. And best of all, it's cheap. The bridge is like space command in Star Trek. Sure, you can have space ships flying around just fine on their own, but if you want any sort of order to the chaos, you're going to need someone in charge calling the shots. The Philips Hue Bridge lets you do just that. Without it, Philips Hue Lights are just plain ol' light bulbs. No smart functionality. No flashy effects. Nothing. So yeah, you're going to need one of these if you don't plan on buying a starter kit. The Philips Hue Go is like a little spotlight that adds a splash of color to the room. It's not going to light up the Hollywood Sign anytime soon, but hey, for the cost, it's actually pretty neat. The idea here is that, like all Philips Hue lights, you can set themes that have certain color schemes. For St. Patrick's Day you might color coordinate your lights to match the Irish national flag. You could do something similar for the Fourth of July with red, white and blue, or go for a spooky Halloween look with orange and purple. Anyways, you get the idea. Have you ever tried to string up lights? It's awful. Bulbs blow out faster that you can replace them. The wires get gnarled. And no matter what, somehow, the cord is never long enough to reach the outlet. The Philips Hue Lightstrip Plus sets out to right a lot of those wrongs by offering a convenient - and I daresay fun - way to add a little ambiance to your walls. Under each Lightstrip is an adhesive coating that allows you to stick the strip pretty much anywhere. Want to add some mood lighting to your bar? Now you can! Chimney needs some color? No problem! Want to stick these lights on your hot tub? That's probably a bad idea. Don't do that.